It sounds like the PC version of the game will, at least initially, just be the "base game," i.e., Deviljho and Lunastra, two monsters that have been added to the console versions, won't be there at launch nor will many of the events. That content will get added in at a later date, but no timeframe has been specified just yet. What's more, based on what producer Ryozo Tsujimoto told PC Gamer, the game's visuals on the PC "will have parity with the console versions but we're considering releasing a free update after launch." So, the bad news is that PC players will (more or less) be hopping into the same Monster Hunter: World that launched on console back in January. The good news is that it sounds like they'll be pushing to get updates to the PC version much faster. Speaking of the console versions, this Friday, July 13, the Summer Twilight Festival kicks off on the PlayStation 4 and Xbox One. 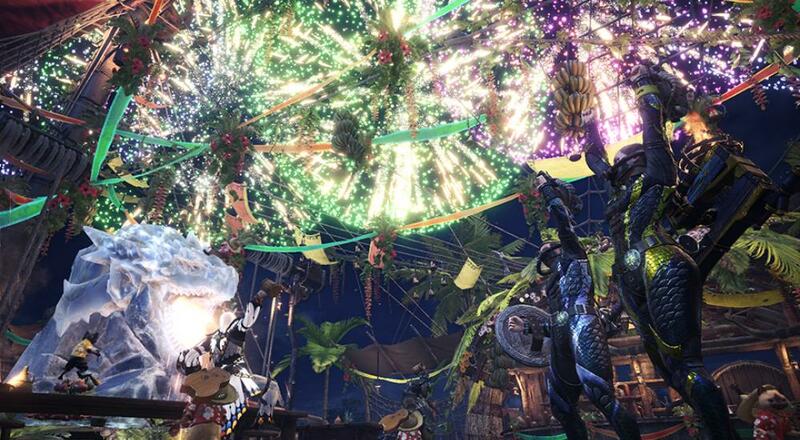 Much like the Spring Blossom Festival back in April, there will be some special events that offer summer-themed outfits for you and your Palico, and "almost all previously released event quests" will be available for the festival's duration (it ends two weeks later on July 26). That means you'll be able to take on Kulve Taroth for her special random stat weapons, or take on those special challenge quests to earn some Street Fighter or Devil May Cry armor. Monster Hunter: World is currently available on the PlayStation 4 and Xbox One. Four player online co-op is supported in most missions. You can check out our full Co-Op Review over here. The game will be available on PC on August 9, 2018.